It was funny. When I was in Watertown over the summer, I made sure to go to the Salvation Army every Wednesday, because that was the day that they had 3 different colored tags that were good for 1/2 off. I didn’t think that we had any SAs in Rochester, but at work, I had to do a mockup for a presentation that was being presented to them. I was so excited! After Church, The Munchkin and I went to go find one in Greece, only to find out that they’re closed on Sundays. Booooo. Luckily, the Craft & Antique Co-Op was open, and down the street from the Salvation Army! They were all decorated old timey style for Christmas. It was so cool. All the people were dressed up in costume. If you’re in the area, you should check it out. I got a bunch of cool stuff for presents and I had The Munchkin pose with Father Christmas. 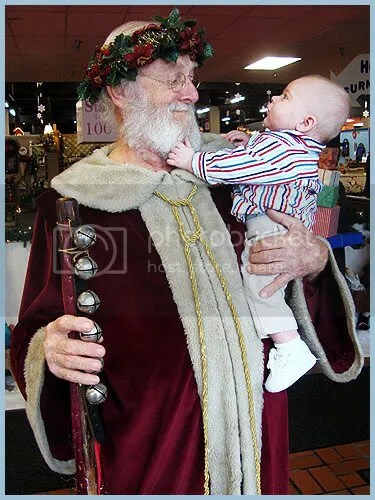 He was fascinated with the man’s beard. So cute!